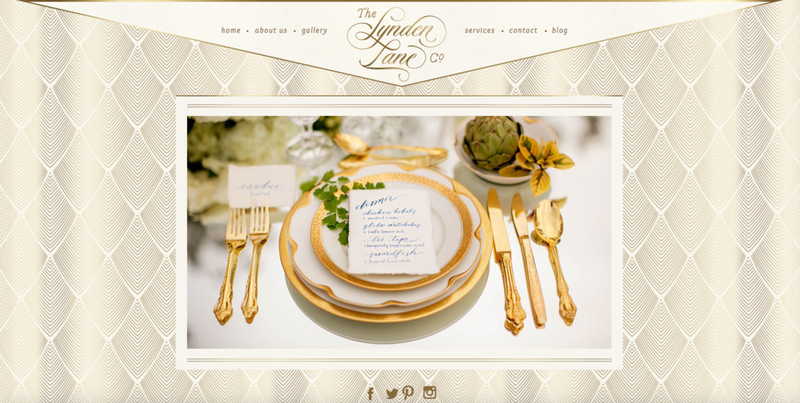 Last Monday I started designing for Barbi and her team at The Lynden Lane Company, a Southern California wedding design and planning company. Barbi and I first spoke about the idea of having me design a website for them a year ago ... and when they decided to finally hire me I was SO excited to get started on a fresh new look for their company. The first thing I wanted to do is create a CLEAN and FRESH feel - The Lynden Lane Company is known for their amazing designs for events and weddings and the last thing I wanted for them was a chaotic space that felt very busy ... I made the choice to use their deep, navy blue logo rather than the gold and I love how it immediately lightened up the website while still keeping a very high-end and luxury feel. ^^ as you can see from the graphic above, their homepage has many opportunities for visitors to click and see more ... and it's visually appealing without being overbearing or cluttered. I simply LOVE it!!!! "We have been following Heather since her days as the editor of Style Unveiled. We always loved her work and I am now a loyal follower of her blog. Her sense of style and humor come through on everything she does! But back to us :) We knew we wanted to update our website well over a year ago and we contacted Heather back then. But as many small business owners know we were juggling budgets and time constraints and we couldn't pull the trigger. But we kept watching her work and her path kept crossing with ours. Finally we released our fear and pulled the trigger! We were so excited when it was our turn to have her work her magic. And that is what it seems like when you work with Heather: MAGIC. She makes everything bright and shiny, beautiful and cohesive. Pictures that I have looked at a thousand times just look more beautiful. The site flows so well now that you never feel like you are stuck. To say we are thrilled is an understatement! We are *%$! OVER THE MOON happy! Put your name on Heather's list now!!!" I am SO excited to share this new launched website that I believe will push The Lynden Lane Company far!! Can't wait to check in with Barbi, Layne, and Lyndsey in a month or so and see how this has help lift their confidence as a company and in turn: helped their business achieve even more then they already have! !